I'm not sure of this little gal's name....but I sure do like her style! This image is on from Just Some Lines. I've told you about them before, but I really can't stop using their images! Have I ever mentioned that my husband and I own a scrapbook retreat? At the retreat, we have a share center so that people can leave papers and supplies behind or take some new found treasures home with them. The reason I am telling you about that is so I can tell you why I don't know the source of this paper. I just know that someone left it behind and I snatched it up. The pink was perfect and I thought adding the green and blue made it look a bit vintage. I ran the pink and the blue pieces through an embossing folder to give them texture which I seem to like these days. The die I used for the focal image is from Spellbinders and is called Labels Sixteen. This is the first time I have used this die and I think I am in love! The bow is a scrap of white seam binding and the button is from PaperTrey Ink. I colored the image with Copic markers and used a bit of pink chalk inside the embossed edges. 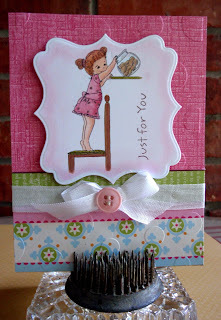 The sentiment is from MFT Stamps. I just placed an order with MFT Stamps and am crossing my fingers that it will arrive this weekend. I can't wait to show you what I have in mind for my new collection of dies and stamps. See you tomorrow. I'll be back with something new and fun.